The lightest speeder in the outer rim! 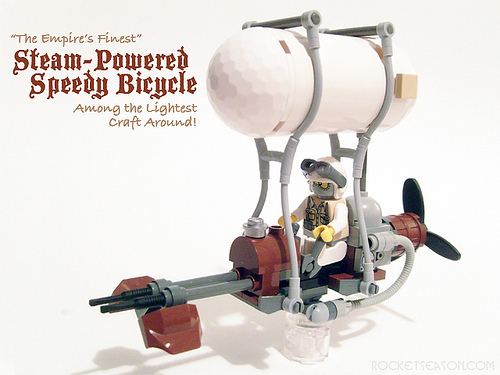 The speeder is instantly recognizable, and yet the balloon gives it a unique steampunk twist. What strikes me most, though, is the way the driver is dressed. This thing can’t possibly go much faster than 10 miles per hour, and yet he’s all decked out in a mask and goggles! It’s that type of humor — whimsy, I guess — that makes for good steampunk. For more pics, check out the full photoset on Flickr. I see now! At first I didn’t get why the fig was wearing white, but he’s a stormtrooper! Duh! Anyway, I’m addicted to steam. A good steampunk MOC is just fun! It’s fun to look at. It’s fun to laugh at… This is great stuff! I like the use of the (indespensible) barrel!